In the third task of the challenge, the robot had to pick up a hose, connect it to a pipe and turn a valve. By sending a virtual robot crab-walking through a simulated disaster zone, a NASA team has cleared the first phase of DARPA's Robotics Challenge, winning funding as well as a real humanoid robot to compete in the next round later this year. Through the contest, the military's Defense Advanced Research Projects Agency, or DARPA, hopes to make more resilient robots that could replace human responders in disaster situations, such as the aftermath of an earthquake or nuclear accident. A total of 26 teams from eight countries qualified to compete in the initial, virtual challenge, which took place from June 17 to 21. These groups had to use their own software to maneuver a simulated robot through a virtual obstacle course and complete tasks like climbing into and driving a vehicle, walking over uneven ground, trudging through mud, and attaching a fire hose to a pipe and turning a valve. Apparently, remaining upright was not one of the requirements to advance to the next level. Roboticists from the University of California, Santa Barbara (UCSB), who teamed up with NASA's Jet Propulsion Laboratory (JPL), explained how they got through the competition in a video. Their robot spent a lot of time scooting around on its bottom, crab-walking backwards through mud and forward over hills and around bricks when standing was deemed unsafe. Their team placed fifth among nine that advanced to the next level. 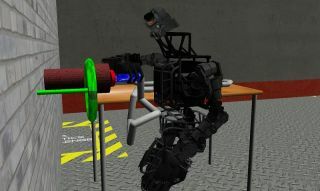 The top six teams will be given an Atlas robot, developed by Boston Dynamics, which they will have to guide through a real-world obstacle course in the DARPA Robotics Challenge Trials in December. Before the winners of the virtual challenge were announced, Gill Pratt, DARPA's program manager for the contest, and Nate Koenig, CTO of the Open Source Robotics Foundation, hosted an "Ask Me Anything" session on Reddit to answer questions about the competition. They explained some of the more creative maneuvers used in the simulation. "A Fosbury flop into the Polaris Ranger was a very creative solution for car ingress," Koenig wrote. Since teams were penalized for falls, they used some innovative walking strategies, Koenig explained. "Many teams choose to crab-crawl if they fall rather than stand-up. This is a very stable method of traversing uneven and rubble strewn ground," he said. Koenig and Pratt also commented on some of the real-world products that might come out of the challenge. "Aside from robots for disaster response, we believe that task level supervised autonomy, improvements in energy efficiency, and improvements in low-cost manufacturing will enable robots to help improve protection and productivity," Pratt wrote, "This will be important in both defense and civilian applications, particularly given our aging population."